as boys from the Mercy or CBS Primary regarding application to enrolment at the CBS Secondary (Coláiste Eamonn Rís, Wexford) or any other Secondary School in town. Welcome To The Faythe School!! The St. John of God Primary School! The Faythe, Wexford, affectionately known as 'The Faythe School. Our aim here is to develop each child's full potential in a mutually respectful and friendly learning environment, by working in collaboration and partnership with parents / guardians, families and the wider community. The trusteeship of St. John of God P.S. was transferred from the Sisters of St. John of God to the Bishop of Ferns. The Faythe School has provided a quality Catholic education to the children of Wexford since March 1875. Everyone connected with the school were delighted to hear the news that the Faythe School is the first school in Wexford town (and only the third in the county) to be awarded the prestigious Digital School of Distinction Award. Welcome St. John of God Primary School! Please click on the 'Children 1st' logo to access all news and information on the new Child Protection Guidelines introduced in December 2017. Click on CREDIT UNION for information letter on Faythe School Credit Union Savings Scheme for 2018. On Sunday 13th March 2016, the Faythe School Rock Choir, nearly 3½ years after applying, were invited to appear on RTÉs Sunday Service. For a few weeks before the Mass rehearsals went into over-drive with sessions on Sundays as well as the usual Monday evenings. Ian, Tricia and Mr. Turner were joined by Ms. Kehoe and Ms. O'Connor before Tricia played her 'trump card' in inviting Catherine 'Biddy' Walsh up to the school to put the Choir through their paces. Fr.James was an ever present over these last few weeks before RTÉ came to the school on 2nd March for a full 'run-through.' The final piece of the puzzle fell into place when Joe Bradshaw from Danone came up trumps with sponsoring a new set of 'shocking pink' hoodies for the girls and blue ones for the dynamic duo. Despite the early departure for Dublin ......6.30am...the Choir behaved impeccably all day long and were a credit to both their families and all involved with the Choit. They should be justifiably very proud of their performance. There are five clips shown below for your delectation!! Enjoy! This award is the Department of Education and Skills flagship programme to promote and acknowledge best practice use of ICT to deliver the best educational experience for pupils at primary level. It aims to build on the progress already made by primary schools in ICT integration and to encourage them to strive for further progression and improvement. So far, only ninety primary schools in the country have achieved this award. That the Faythe School has achieved it is a massive validation of the investment in ICT by the BOM over the past few years, in stark contrast to the absence of any DES funding for ICT at the same time. It is also an acknowledgement of the continuous professional development undertaken by the staff to keep abreast of the rapid changes in technology that allows them 'deliver the best educational experience for pupils at primary level' on a daily basis. Sincere thanks to every single one of the 648 people who packed the 'Parish Hall' last Friday night for what was a magnificent way to celebrate to school's 'change of status' next September. anyone I have left out for not taking offence, because it wasn't meant. A full gallery of photos will be posted when normal energy levels have been restored. Rianna Returns for Aviva Soccer Sisters Launch! Congratulations to Ms. Mullins and Colm from the SEFRC for all their work with the children in the 'School Garden'which culminated in a 'Silver' at the recent Wexford in Bloom 2013 Awards Night. :D Well done Girls' Gaelic Football Team. Well done to our girls Gaelic Football team who have won their first two matches in this year's Rackard League Football competition. 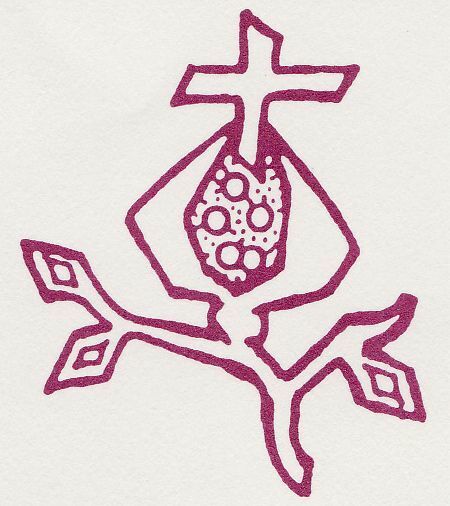 Our logo is a cross and an open pomegranate. The cross is the universal symbol of Christianity. The pomegranate has a strong association with the city of Granada in Spain where our patron, St. John of God, lived. The abundance of seeds in the pomegranate is a reminder of God's endless love for us. USE THIS BUTTON TO MAKE PAYMENTS FOR BOOK RENTAL SCHEME OR A DONATION to the school. After the payment transaction has been done, we will both receive a payment notification but please keep your Paypal email transaction as your payment confirmation. Thank you!